Stegosaurus Studios: Now Taking Commissions! Hey gang, Gencon is rapidly approaching! While I'm excited to go, my pockets are a little more empty than I'd like. How can I buy drinks for all my friends like this? 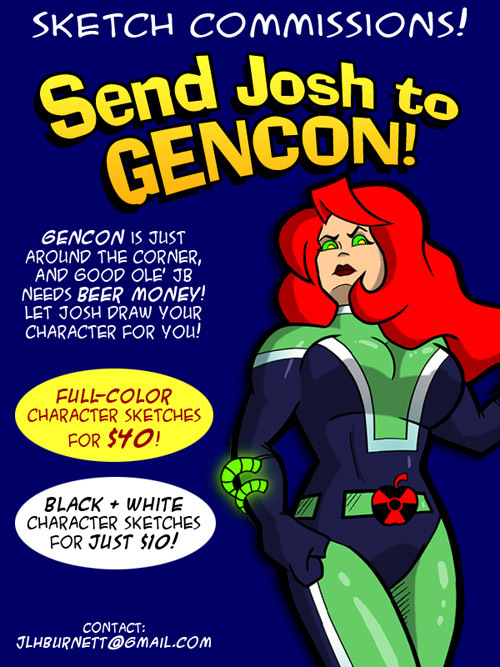 To rectify this problem, I'm starting a new promotion, The Send Josh to Gencon Sketch Commission Special! Full color character sketches are a mere $40. Black and White sketches are a paltry $10. Any character! Any genre! Immortalize your favorite PC with an original illustration from me, good ole' JB! Check out my Deviant Art gallery to see the kind of stuff I can do for you! UPDATE: Round one was huge success! Big thanks to all my patrons. Now on to round two!